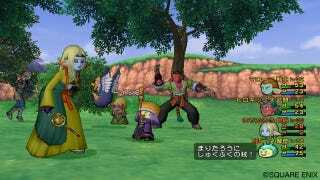 Dragon Quest X Gets a Release Date for Japan! Square Enix's highly anticipated 10th Dragon Quest game has just gotten a release date! The new online RPG, Dragon Quest X will be hitting the shelves (in Japan) on August 2nd of this year. Much like the 11th and 14th incarnations of the Final Fantasy series, Dragon Quest X will be online only with a fee of ¥1,000 (US$12.50) for 30 days, ¥1,950 (US$24.80) for 60 days, and ¥2,900 (US$36.25) for 90 days of online use. Square Enix has announced they will have a "kids time" where users can play for free, but further details have not yet been released. Each player can create up to 3 different characters to explore the online world. The game will include 2 discs, and requires a 16GB or greater USB memory to play. Standard Wii controller, Classic controler, Classic controler PRO, and USB keyboard interface are supported. Dragon Quest X will be released in 2 versions: The ¥6,980 (US$87.25) Standard version, and a ¥8,980 (US$112.25) version that will include a compatible USB memory. Both versions will come with a 20 day game ticket.